“I have been reading your story everyday for the past month. I think it is about time I wrote a comment. We have never met and I don’t think we ever will. But I’m praying for you! Get well soon Ashtyn!” J.J. But are we really strangers? No one in Ashtyn’s Army knows all the members, but I just don’t believe any of us are strangers. At least to me it doesn’t feel like we are. We all have similar feelings of love for this young girl. We all have been inspired and uplifted in some way. We all feel heavy in our hearts when she struggles and overjoyed in her triumphs. We all want the best for her. If you have read all the blog posts from the time Ashtyn was diagnosed with cancer, you know as much as I know. You don’t know any less than I do and are walking beside us every step of the way. Many people feel they know Ashtyn though they have never met her. We too feel a connection to you. When I receive a message from a “stranger” I don’t feel it is from a stranger at all. I feel it is from a friend who cares for and loves my daughter. How can I not love you back? I have wondered on several occasions why Ashtyn has touched so many hearts. I don’t know for sure but one thing I do know, it’s not me. I can write a blog all day but no one will care unless their hearts are touched. 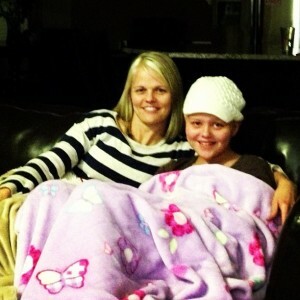 I believe the Spirit is touching hearts because of Ashtyn’s spirit. She needs you and maybe you can benefit from her as well. It really is remarkable and such an amazing feeling to have a literal connection to hundreds of people. You are not strangers to me. So you know what we should do? 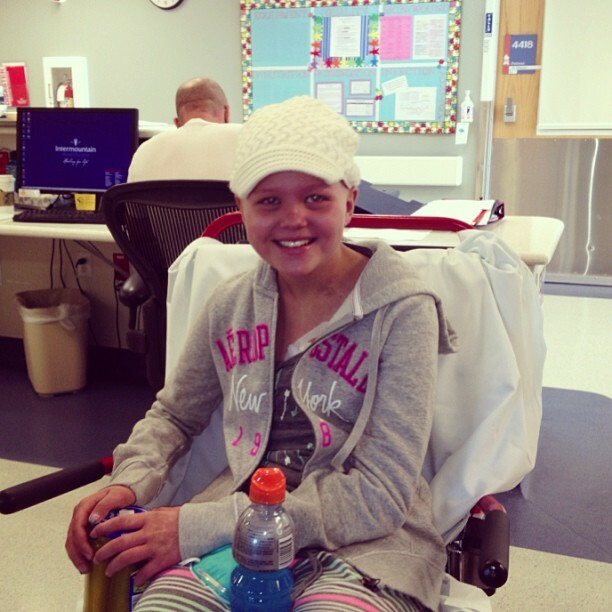 Once Ashtyn has triumphed over cancer and the war is over, we need to have a party. We need to gather together, meet face to face, and celebrate what Ashtyn has accomplished through the help and prayers of her Army. It will only be fitting to celebrate a war that has been won with the Army that got us there. We will gather as non-strangers and Ashtyn will be able to see with her own eyes the hundreds of people that rallied around her. She will be able to see those that lifted her up for months and gave her the strength and power to accomplish what she wouldn’t have been able to do alone. A victorious party is what we will look forward to. Now for the update: Ashtyn and I continue to not be able to sleep at night and are exhausted during the day. It is unfortunate because we are not awake when everyone else is. I was tired during the day and hardly effective around my house. Ashtyn slept the entire time her siblings were at school, however she was awake the rest of the evening. Even though it would be ideal to be on the same day schedule as everyone else, Ashtyn and I do enjoy the peacefulness of the night. I am sure that is the reason we got into this predicament in the first place. The hospital is very quiet and peaceful at night. Ashtyn preferred sleeping through the chaos of the day and enjoyed the nights when she would not be bombarded by people. Tomorrow we have to wake up and go to the hospital for a bone marrow aspirate and biopsy at noon, so hopefully we will start our transition to being on a day schedule. Ashtyn seems to have a lot of cravings for different kinds of food. She always craves pickles and salt and vinegar chips. Other cravings that are on the list include a grilled cheese and peanut butter sandwich with a pickle from Melty Way. She has asked for a Nutella crape cupcake from The Sweet Toothfairy. Before going back to the hospital she really wants to go to Olive Garden and Bonsai Japanese steak house, where they cook all the food in front of you. Tomorrow she is already looking forward to having a vegetarian subway sandwich with a bag of salt and vinegar chips. I am so grateful she has an appetite and cravings. She is too. Getting a lot of nutrition will help her during the next round of chemo. FROM ASHTYN: “Today I was thinking about Disneyland and had a feeling I will be able to go. I thought about eating the big pickles and hard scooped ice cream you get on Main Street. I thought about going on rides like Space Mountain, Splash Mountain, Thunder Mountain, and Matterhorn. I pictured going to the Golden Horseshoe comedy show with the chili bread bowl. We will go to Cars Land and get another pickle that they sell at the entrance. I won’t be able to go on the Grizzly River Run because it would get my broviac line wet or Screamin because the seatbelt will hurt where the line is. That’s OK I pictured walking early morning to Disneyland and going through the entrance. It would be so cool. I really need to have an absolute neutrophil count of 1000 to go to Disneyland. Yesterday I was still at zero. All I really want right now is to go before I return to the hospital. That is my main goal. Please pray that I will be able to get my white blood cells up. I really hope it will go up within a week and a half. I am worried because I think I will have to go back to the hospital in about 2 1/2 weeks. Saturday we really expected Ashtyn to be able to go home. She had met most of the discharge requirements. She was awake and alert, walked well, ate and drank enough, didn’t have significant pain, her temperatures were normal, and overall she looked really good. Thursday and Friday her white blood cell count (WBC) went up. Though the increase was slight, it was still a sign that she was no longer declining. In my mind, she was fully ready to go home. At this point in Ashtyn’s recovery, the doctors were not worried about how many WBC’S Ashtyn had, they just wanted to see the counts trending up. 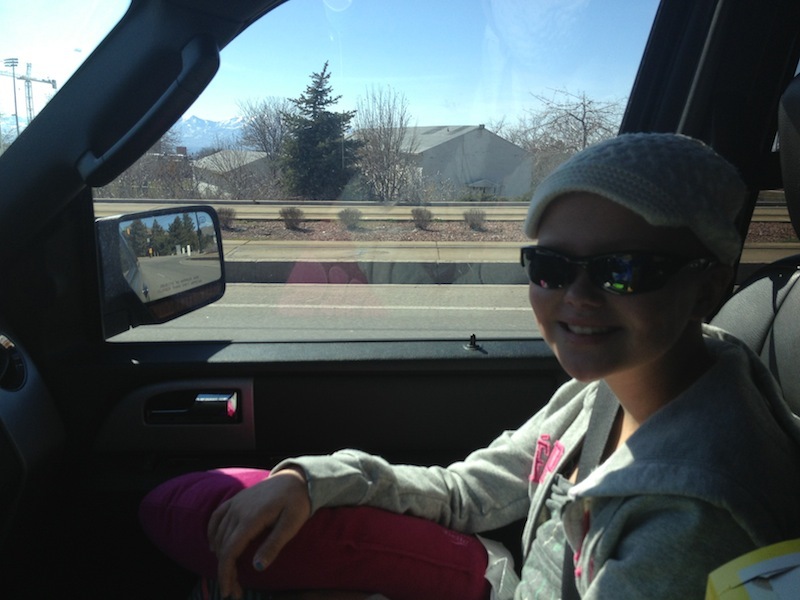 In order to go home Saturday, her blood work had to show some sign, any sign, that she was still improving. Ashtyn knew how close she was to going home. She was hopeful as was I. To prepare, I packed up a lot of her things Friday night to be sent home. Since I always stay up until around 4 am, I decided to not go to sleep until 5 am Saturday morning so I could see her lab results. The results came back at 6 am. My heart dropped when I saw the numbers. Not only did they not go up, but the monocytes went from 3 back down to zero. Bummer. I went to sleep thinking about how Ashtyn was going to take the news. When she woke up I told her that she would not be able to go home that day. She cried. I laid by her and rubbed her back in silence. I wanted her to be able to express her emotions and get it all out. She cried for about 7 minutes and then was done. Instead of sitting in sorrow, she ordered breakfast, ate Frosted Flakes and peaches, and watched The Cosby Show. For lunch she texted her dad for him to bring her a bean and cheese burrito, crazy bread, gummy worms, a cherry Slurpie, and seasons 5 and 6 of The Cosby Show. Sunday morning Ashtyn had blood taken again for labs and again I saw the results at 6 am. Her WBC’s had not gone up or down. The doctors had always informed me that she needed to have two days in a row of improvement in her labs to go home. I laid back down in bed with Ashtyn and started formulating the fight I was going to present to the doctors later that morning. “Why can’t she just recover at home and continue getting blood work done with a home health nurse? She is just as safe in her home as she is in the hospital as far as infections are concerned. I will keep her away from crowds, anyone sick, and use a lot of hand sanitizer at my house. She has to come back Tuesday anyway for a bone marrow aspirate so can’t we just see how she does at home for two days? She ate so much yesterday and is feeling good.” I was fired up and ready to present my argument. I was almost too fired up so I was glad it was only 6 am so I could sleep a couple of hours and mellow out a little bit before talking to the doctors. At 10 am two doctors woke me up. “We saw the labs. They weren’t really good but we think she can go home today and recover further there.” Did I hear right? “She can go home today?” Yes was their reply. I didn’t have to petition or plead Ashtyn’s case. Sweet. “Ashtyn, did you hear what the doctors said?” Irritated she said, “Mom! I am sleeping! Don’t wake me up.” Ashtyn had become good at using a coping mechanism of sleeping while doctors talk because she never wanted to know what they had to say. In her perspective, it’s always scary stuff they talk about. After the doctors left I asked the sleeping tween, “Do you want me to tell you the news now or later?” Without opening her eyes and still irritated she said, “If I can’t go home today, tell me the news later.” I replied, “You can go home today.” She was suddenly awake, smiling, and in a good mood. It took a few hours to pack up her things and get discharge orders. Four hours later we walked out the door where her siblings were there to greet her. She was relieved to go home. The night seemed to be a calm and relaxing reunion. At 9:30 p.m. all the kids were in bed for the night except Ashtyn. She wasn’t sleepy, so what did she do? She sat on the couch with a comfortable blanket, a Slurpie and treats, and watched The Cosby Show. At 1 am she climbed into my bed. She didn’t want to sleep in her own bed but rather with me. I gave her several pills to swallow and an IV antibiotic. By 2 am she was asleep next to me. Obviously it takes time to transition into hospital life and it takes time to adjust back to home life. I’m up at 4 am again. In a few hours I’ll be taking my kids to school. Hopefully Ashtyn and I can get back on schedule. It is good to be home. We are going to soak in the vacation of being home and enjoy every moment.